The folks over at IGN got an early look at the upcoming Majora’s Mask 3D and with it they have published direct feed footage of the first three minutes of the game. This includes the opening cut-scene with Link and the Skull Kid, where Link has his Ocarina, as well as Epona stolen from him. 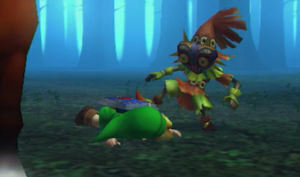 There is also a few seconds of gameplay, showing Link running through the revamped Lost Woods portion of the game. Go ahead and make the jump to check out the video.